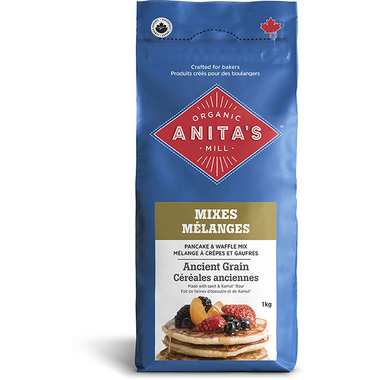 Anita's Ancient Grains Pancake & Waffle Mix has been made from a unique blend of 100% Canadian whole grain Spelt & Kamut Khorasan flours. The combination of these two grains creates a mildly sweet, nutty, rich and buttery flavour which makes for outstanding pancakes or waffles. Pancakes: Place 1 cup mix in bowl. Add 1 beaten egg, 3/4 cup milk & 1 Tbsp melted butter (optional). Stir until blended. Cook on preheated, oiled griddle until bubbles form in centre of pancakes. Turn and cook until golden on the other side. Enjoy! Waffles: Place 1 cup mix in bowl. Add 1 beaten egg, 3/4 cup milk & 1 Tbsp melted butter. Stir until blended. Cook on waffle iron until golden. Enjoy! Delicious Variations: Substitute 1/4 cup of milk with 1/4 cup of yogurt for added flavour and probiotics! Add 1 tsp of cinnamon and 1/8 tsp of vanilla or your favorite fresh or frozen blueberries, raspberries or strawberries. And for an extra treat, add a handful of chocolate chips into the mix. You will not be disappointed! 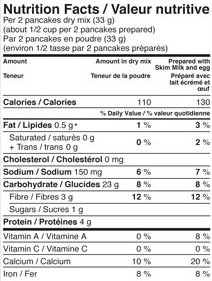 This is my favourite pancake mix. It tastes so good. I just add almond milk to it and no egg and it comes out perfect for a vegan meal. Love the taste and that its good for you. The whole family loves it! First taste was delicious - and good for you. I love this pancake mix, good ingredients (no chemicals), tastes great. It's a convenient and hearty alternative for breakfast, good with blueberries. We enjoy this for pancakes! Recipe makes just enough for my husband and I and our 3yr old. Will be buying again! Love that it's milled in Chilliwack BC :) we also tried it in our waffles maker but they stuck. Not sure if it was the batter or our waffle iron. That's why it's only 4 instead of 5 stars. Curious to try it as bannock as well.